To begin searching the archives of Cape Cod newspapers, type your search term(s) in the box at the top of the page and click the magnifying glass, or choose the SEARCH or BROWSE options from the menu. 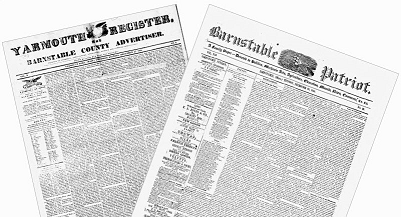 The Barnstable Patriot began publication with its first weekly issue on June 26, 1830. The Patriot is the oldest continuous, uninterrupted publication in Barnstable County, Massachusetts, and is the seventh oldest newspaper in the United States. Originally published by Sylvanus B. Phinney, Frank Goss took the reins in the late 1860s. An astute publisher and businessman, Goss, along with his sons, also established several other Cape Cod newspapers. The Barnstable Patriot and Register digital newspaper archive now covers the entire run of the Barnstable Patriot, from 1830 to 2017 and The Register - at times called the Yarmouth Register and the Dennis-Yarmouth Register - from its inception in 1847 to 2017. You can choose to search each of The Register titles separately, or all at the same time. For more information or for assistance, call the Yarmouth Library at (508) 760-4820 or see the library's website at www.yarmouthlibraries.org. This project was funded in part by the Institute of Museum and Library Services (IMLS) as administered by the state of Massachusetts. Additional funds were provided by the Lothropp Family Foundation and a generous grant from the Town of Barnstable Community Preservation Committee, the Town of Dennis Preservation Committee and the Town of Yarmouth Preservation Committee.